After personally suffering from intense anxiety for several years and then dropping into a deeply depressed state, I know what it feels like to be at rock bottom. I resorted to treating myself following several failed attempts with outside help and brought myself completely out of my anxiety and depressed state. I now know I will never feel anxiety again related to my past experiences nor will I ever go back into that depressed state. That is a big statement but what gives me the confidence to make it is, for well over a decade I have also been helping others to Wake Up and Change Their Lives with very positive results. At last I have documented the processes and understandings necessary to create the good life you deserve. These lessons lay in the pages of this book as well as in the client videos, training videos and worksheets in the supporting membership website that goes hand in hand with this book. I created this programme to help you overcome difficulties easily and quicker than I did. As human beings our natural state is to be happy. Every moment of every day we are striving to feel the feeling of being safe and happy. Unfortunately, for most of us we experience many challenges like trauma both physical and emotional, disappointment, fear, overwhelm, frustration, poor relationships, stress, money worries, health worries and it can be almost impossible to find someone or a system to help relieve these challenges. Wake Up and Change Your Life was written with this in mind. I get you! I know you want to feel good when you open your eyes in the morning. I know you don’t want to feel stress, worry, overwhelm, self sabotage, procrastination any more. You know there is much more to life and you are just not feeling it. This book and program is both practical, logical and it brings you through the process of positive change step by step as well as introducing you to many clients who have followed the system to Wake Up and Change their lives for the better. You will meet these clients and hear their inspirational stories in both the pages of the book and on video in the membership site. 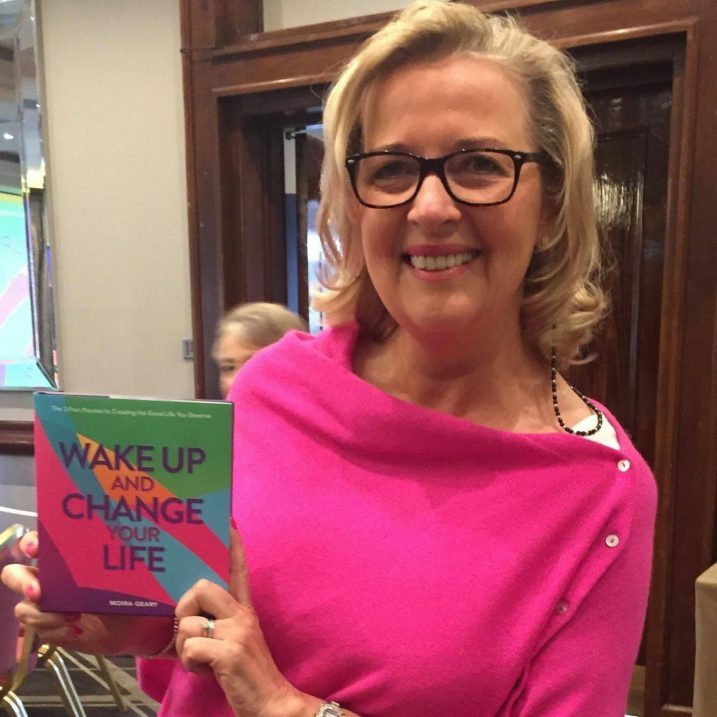 When you purchase Wake Up and Change Your Life you will receive by post a copy of the beautifully designed hardback book presented in its unique gift box. You will also gain immediate access to the private membership site where you will be able to access your library of training videos and worksheets. There are also videos of real life stories from clients on the particular teachings, processes and concepts that helped them to deal with specific situations in their lives and shows the positive results they got. There is also an online copy of the book in the membership area for ease of access. Knowing how to create the good life you deserve – I walk you through a specific sequence of steps and understanding that will help you make massive positive change in our life when applied. Immediate access – you will get immediate access to the complete library of training videos, worksheets as well as an online copy of the book so that you can access it any time any where without having to have the hard copy with you. You will have access to the private membership site for life. Hard copy – your beautifully designed hard copy of the book in its stunning gift box will be on its way to you by post as soon as you process your order. Even though you will have all the information in the website I wanted everyone to also have a hard copy of the book to have and to hold. I’m Moira, also known as the Recombobulator, author and creator of this program Wake Up and Change Your Life. As a person who is passionate about helping people make life easier, I constantly strive to create processes, techniques and methods to instigate positive change so that you can create the good life you deserve filled with peace, joy, excitement, love and bliss. You could be frantically searching for help from friends, family or even on the Internet, but unless you find a specific process that actually works time and time again you could be staying stuck when it is not necessary. We only have a limited number of years in this life and to me it’s important that we all make the very best of the life we have. If your life feels mediocre, unhappy or stressful that is not fair on you. You owe it to yourself and those around you to take steps to improve your situation. It might sound strange but it is true “life does not need to be as difficult as we make it”you can create positive change. Your goal when working through this book and program is to relax into the processes and allow them to help you transform your life. I’ve made it super easy for you to do that with all the videos and information in the private membership site ready for you. You will have everything at your finger tips. If I am not technical will I be able to manage the website? How long will I be able to access the videos in the website for?You will have continuous access to the information in the website for as long as you need. How long does it take for the hard copy of the book to arrive? We endeavour to dispatch books within 48 hours of order. Following that time we are relying on the postal service to get your book to you as soon as possible. Do I have to pay extra for postage? No, the programme price includes postage of the beautifully designed hardcopy of the book. Are you ready to Wake Up and Change Your Life?